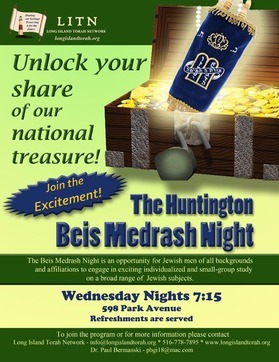 The Beis Medrash Night is an opportunity for Jewish men of all backgrounds and affiliations to engage in the excitement of personalized Torah study. You will be matched up with one of our fantastic Rabbis for either small-group or individualized study of a topic that is interesting and comfortable for you. This casual and relaxed format (along with refreshments) makes for a truly enjoyable evening.